It is my pleasure to share with everyone the news that three staff members from YAD will receive awards at the Annual Juvenile Detention Alternative Initiative (JDAI) Awards Breakfast on September 20, 2018 (see attached flyer). JDAI is a national juvenile justice initiative that focuses on reducing the unnecessary and harmful use of secure detention for juveniles. It has a special focus on reducing racial and ethnic disparities in the juvenile justice population. Dozens of YAD staff members and private attorneys participate in JDAI activities on a regular basis. Mona Igram, the Attorney in Charge of the Lowell YAD office, is the 2018 recipient of the Jane E. Tewksbury Leadership Award. She will also be the Key Note Speaker! 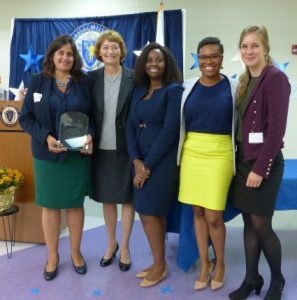 Mona is being recognized for bringing issues around racial and ethnic disparities to the forefront in the Lowell and Lawrence juvenile courts. She is also coordinating trainings for lawyers and the community at large in an effort to reduce the disparities. She is currently chairing a committee that is putting together a two day program called Juvenile Defenders Dismantling Racism, to take place on September 21 and 28. Lauren Russell, Staff Attorney with the Salem YAD office, is the 2018 recipient of the Tenacious Initiative Award for Essex County. 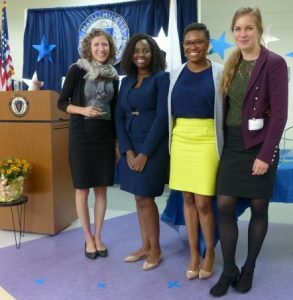 Lauren is being recognized for being a zealous advocate in her fight for equity in the juvenile justice system and holding all systems accountable to ensure children are, in the words of the Annie E. Casey Foundation, “in the right place for the right reason”. It is nice to see other stakeholders in the court system show respect for our efforts to insist upon proper due process in all cases. 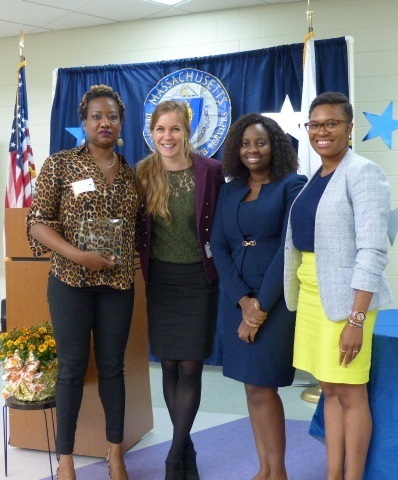 Naretha Griffin, Administrative Assistant with the Springfield YAD office, is the 2018 recipient of the Standing Ovation Award. Naretha, a critical member of the Springfield YAD team, went above and beyond her job duties when she responded to JDAI’s call for action to find alternative ways to addressing racial and ethnic disparities in juvenile justice agencies. Naretha developed and implemented a creative approach to increase awareness among law students of the profound racial and ethnic disparities that are endemic to our court systems, as well as to successfully recruit law students of color to CPCS. Naretha has shown us that everyone in the agency, regardless of job title, has the power to be an advocate and a leader in our mission to help our clients experience true justice. I am proud to see that staff members, regardless of job title, are playing leadership roles in helping to reduce racial and ethnic disparities in our systems, as well as decreasing the lengths of stay for juvenile’s in detention. Please join me in congratulating Mona, Lauren, and Naretha!